The calculations show that some large reserves simply shouldn’t be tapped. For instance, essentially all Arctic oil reserves and 99 percent of Canadian oil sands are rated as unburnable under the model, a calculation that will surely give ammunition to those opposing the Keystone pipeline. 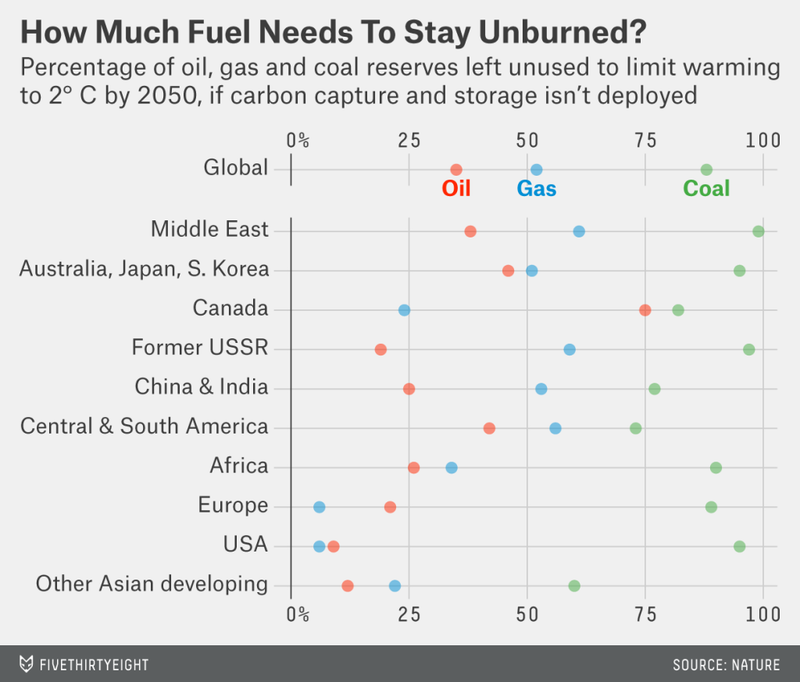 More than half the world’s unburnable oil lies in the Middle East, but the model shows that the region could exploit more than 60 percent of its reserves without blowing the global carbon budget. The U.S. and Europe have the greatest flexibility to extract its reserves and remain within budget, in part because their proximity to energy users makes it more economical. The fact that we can’t even use all of our current reserves calls into question the value of discovering or developing new sources of fossil fuels. [Study author Christophe] McGlade told Mashable the countries that will be hurt the most by the carbon budget constraints are those that are heavily dependent on coal the countries that will be hurt the most by the carbon budget constraints are those that are heavily dependent on coal, which is among the most carbon-intensive fossil fuels. “It’s companies and countries that hold large coal reserves that are going to suffer under a 2 degree scenario, and also the Arctic oil,” McGlade said. For example, McGlade said that meeting the temperature target in the most cost-effective way means foregoing the exploitation of 80% of the world’s coal reserves. Over the past few years, coal has become more expensive in many countries, including the U.S., compared to natural gas, thanks to fracking technologies that have produced a glut of gas. Of course, the model has to make assumptions about future oil and gas prices that are basically impossible to be certain about. Unexpected changes to the price of oil, for example, could upset the cost equation for drilling in the US and re-shuffle the entire regional breakdown. But even as an estimate, the study really illuminates the vital need for policies all over the world that dramatically cut our dependence on coal. Next Next post: Who Won’t Republish Charlie’s Cartoons?